Quality hardware like this brass and wood bridle bracket can have an amazing effect on a tack room, elevating the space from utilitarian to inviting. This handmade brass and solid wood bridle rack brings a refined character to the tack room. Functional and beautiful, this is modeled after vintage horse stable hardware. 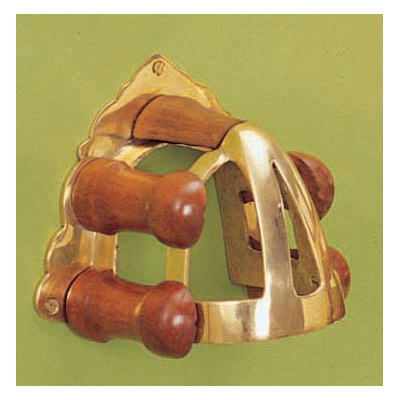 One look at the hand shaped wood balusters and polished brass indicates the quality of this heavy duty bridle hook- but the function was not ignored in creation of this piece. 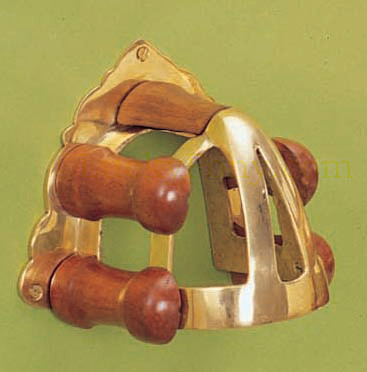 This bridle hook is styled so that the bridle's crown is supported at 5 points- preventing storage damage and ensuring that the bridle maintains its shape. See chart below right for quantity discounts. Measures 7 inches wide, 6 inches high, and extends 5 inches out from the wall. Mounting hardware included.